Have a new construction project? Let Proline Surveying guide you through the surveying process. 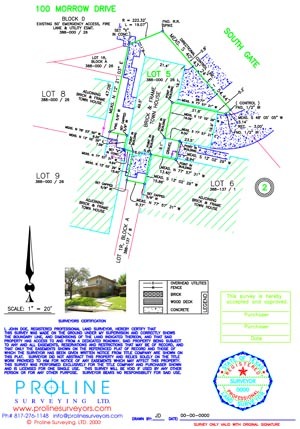 Lot survey/envelope: This is the initial survey of your lot. Your property corners are clearly marked with stakes, flagging, and orange glow paint. For an additional fee we can also stake the corners of your future building, making it easier for the forms to be set. Form: The second phase of the new construction process, a form survey will re-identify the property corners and record the location of the form boards on the lot. This assures that your building is where you want it to be, outside all building lines, and utility easements. Final: The final step in the new construction process. Our crew surveys all improvements on the property, including the building, concrete, fences, and any other permanent fixture. Then we record the elevations of the land and make measurements as to the drainage tendencies of the lot. In the end, you have a well executed project you can be confident about. We provide all the necessary documents to inspectors and Title Companies to make sure that your experience is as hassle free as possible.